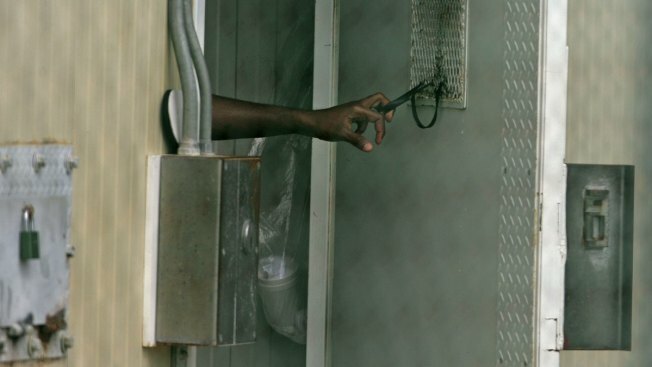 In this Oct. 9, 2007 file photo, a Guantanamo detainee closes a door at the detention facility at the Guantanamo Bay U.S. Naval Base in Cuba. Somali prisoner Hassan Guleed at Guantanamo Bay told a military judge on June 2, 2016 that he has experienced what he believes are intentional noises and vibrations inside the high-security section of the prison known as Camp 7, echoing a defendant in the Sept. 11 war crimes case who has alleged he is the victim of deliberate attempts at sleep deprivation. A Somali prisoner at Guantanamo Bay told a military judge Thursday that he has experienced what he believes are intentional noises and vibrations inside the high-security section of the prison known as Camp 7, echoing a defendant in the Sept. 11 war crimes case who has alleged he is the victim of deliberate attempts at sleep deprivation. Hassan Guleed, an alleged member of East Africa Al-Qaida making his first appearance in a U.S. court since his 2004 capture, portrayed sounds and vibrations as well as chemical odors in testimony at the U.S. base in Cuba as "a kind or pressure" intended to make detainees cooperate with authorities. He contrasted it with other forms of abusive treatment that he and others experienced while held by the CIA in overseas prisons before being taken to Guantanamo. "We have mental torture in the Camp 7. In the black site there was physical," Guleed started to say when prosecutors and the judge cut him off to keep him from discussing details about his confinement that are classified as secret. Guleed said several other prisoners have experienced the same sounds and vibrations, including Khalid Shaikh Mohammad, the self-proclaimed mastermind of the Sept. 11, 2001, terrorist attack, and Abu Zubaydah, a Palestinian who was the first prisoner to be subjected to brutal CIA interrogation techniques. The Somali prisoner, who wore a black and white head scarf and a traditional white dress shirt as he testified in broken English, faced aggressive cross-examination from federal prosecutor Ed Ryan, who sought to show he was a biased witness by asking him about allegations that he trained at an al-Qaida camp and performed surveillance on a U.S. military base as part of a suicide bombing plot. Guleed, who has never been charged with a crime, denied involvement with al-Qaida. "You are lying to us right now aren't you sir?" Ryan asked. The defendant said he was not. Twice, courtroom monitors cut the sound feed so that spectators could not hear information deemed classified. The testimony was intended to support allegations by Sept. 11 defendant Ramzi Binalshibh, who has alleged he has been subjected to intentional sleep deprivation, which his lawyer says interferes with his ability to participate in his defense. Binalshibh, Mohammad and three other Guantanamo prisoners face trial by military commission for planning and providing logistical support to the Sept. 11 hijacking plot. They could get the death penalty if convicted. Abu Zubaydah, who has not been seen in public since he was captured in Pakistan in 2002, had been expected to testify Thursday about his own experiences with noises and vibrations in Camp 7. But James Harrington, a civilian lawyer for Binalshibh, asked the judge to postpone his appearance just as he was about to come into the courtroom when it became clear that the judge would allow Ryan to ask questions similar to those he asked Guleed. Unlike the Somali, Abu Zubaydah has a lawyer, and he told the court that he would object to incriminating questions. Military officials have repeatedly denied that guards in Camp 7 intentionally made sounds or vibrations, though there has been documented use of sleep deprivation during interrogations in CIA black site prisons and Guantanamo in the past. Prosecutors have suggested in court that Binalshibh is inventing allegations that have become one of the many issues that have sidetracked proceedings in the Sept. 11 case, which remains in the pretrial stage with no trial date set. The judge, Army Col. James Pohl, earlier issued an order directing the military to cease any deliberate noises or vibrations without determining whether any had occurred. Binalshibh says it has continued despite that order.